2-Oxazolidones are an important class of nitrogen-containing heterocyclic compounds, which have been found to have a wide range of applications as chiral auxiliaries and chemical intermediates in organic synthesis. Moreover, some 2-oxazolidones such as linezolid, toloxatone, and tedizolidare are shown to have high potency as biologically active molecules and are widely used in the pharmaceutical industry. Therefore, many efforts have been dedicated to synthesize these useful cores. 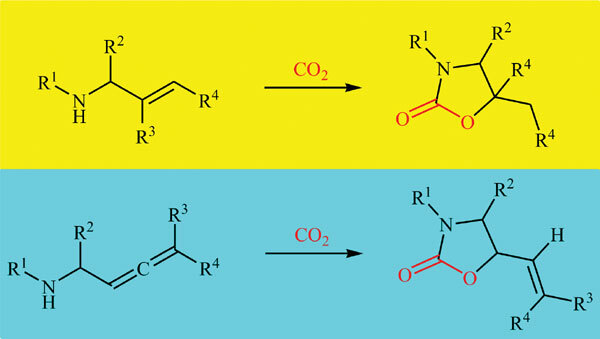 Among recent reported synthetic methods, the carboxylative cyclization reactions of inexpensive and easily available allylic and 2,3-allenic amines with CO2 are one of the most interesting and promising synthetic procedures from the viewpoint of developing CO2 as carbon source, since the chemical conversion of CO2 into the value-added chemicals is one of the most important topics in green and sustainable chemistry. In this mini review, we highlight the advances in the synthesis of 2-oxazolidone derivatives through chemical fixation of CO2 to allylic and 2,3-allenic amines from 1987 to 2017, with special emphasis on the mechanistic aspects of the reactions. Carbon dioxide, 2-oxazolidones, allylic amines, α-allenylic amines, carboxylative cyclization, green chemistry.